"I have sometimes thought of going away, but I imagined that as a kind of holiday, a series of adventures like Bilbo's or better, ending in peace. But this would mean exile, a flight from danger into danger, drawing it after me." 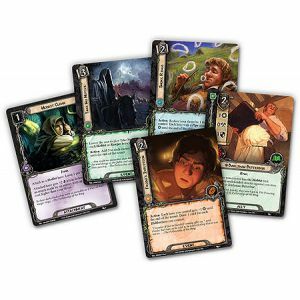 Accompany Frodo along a desperate journey as the fate of all Middle-earth hangs in the balance! 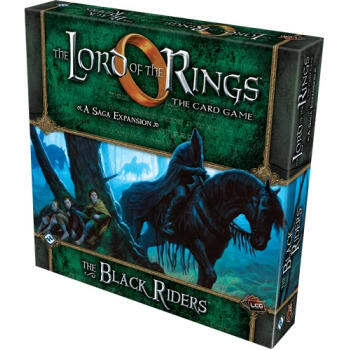 The Black Riders Saga Expansion for The Lord of the Rings: The Card Game allows you and your friends to directly relive Frodo's travels and challenges from the early chapters of The Fellowship of the Ring. 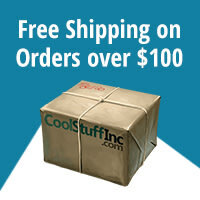 Step into the beloved fantasy world of J.R.R. Tolkien, journey out of Bag End, and hide from the fearsome Nazgul. In three new scenarios, you'll sneak out of the Shire, meet strangers in The Prancing Pony, battle undead foes at Weathertop, and race for the healing halls of Rivendell. 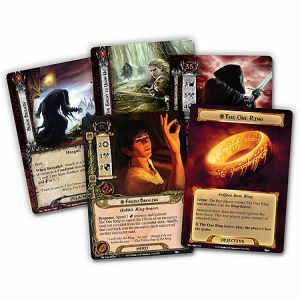 In addition to its three scenarios, The Black Riders introduces five hero cards and thirty-three player cards (three copies each of eleven individual cards), which offer players a wealth of deck-building options for strategies built around Hobbits. Plus, a new Campaign Mode allows you to string the expansion's scenarios together as the first chapters of your epic journey to Mount Doom!